For my American audience, Happy Thanksgiving. Coffeespoons will be on holiday for the remainder of the week. But don’t worry, we’ll be back. For my non-American audience, we basically celebrate a tale of the Pilgrims feasting with Native Americans after a successful harvest. Today’s graphic is really just a series of tables. I think I missed this back in 2016 because, surprise, I had just moved to Philadelphia and was still settling into things—including running Coffeespoons. 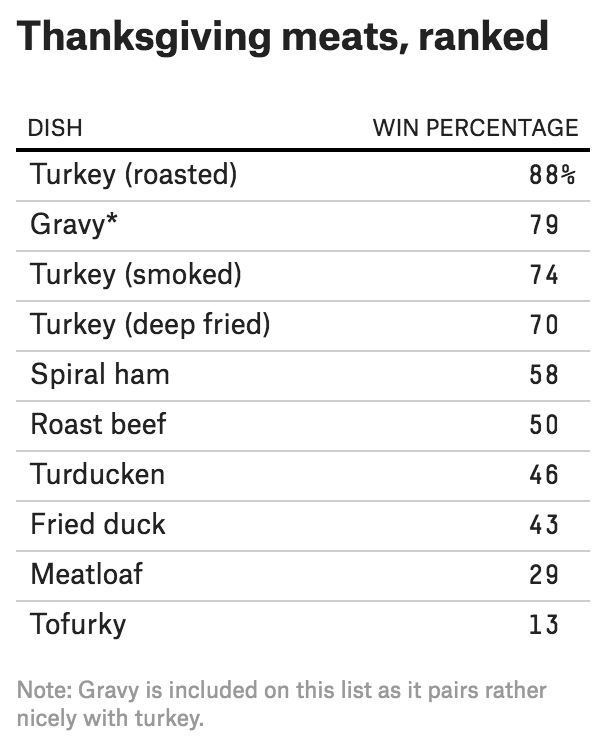 Anyway, FiveThirtyEight published an article trying to discover the most popular dishes. This is just a sampling , a screenshot of the meats. But you should go check it out to see if your favourite dishes made the cut. Mine did not. I am not a big fan of turkey and am doing a pork roast tomorrow . I guess I could go with the ham in a pinch though. Credit for the piece goes to Walt Hickey. Wildfires continue to burn across in California. One, the Camp Fire in northern California near Chico, has already claimed 77 lives. But why has this fire been so deadly? 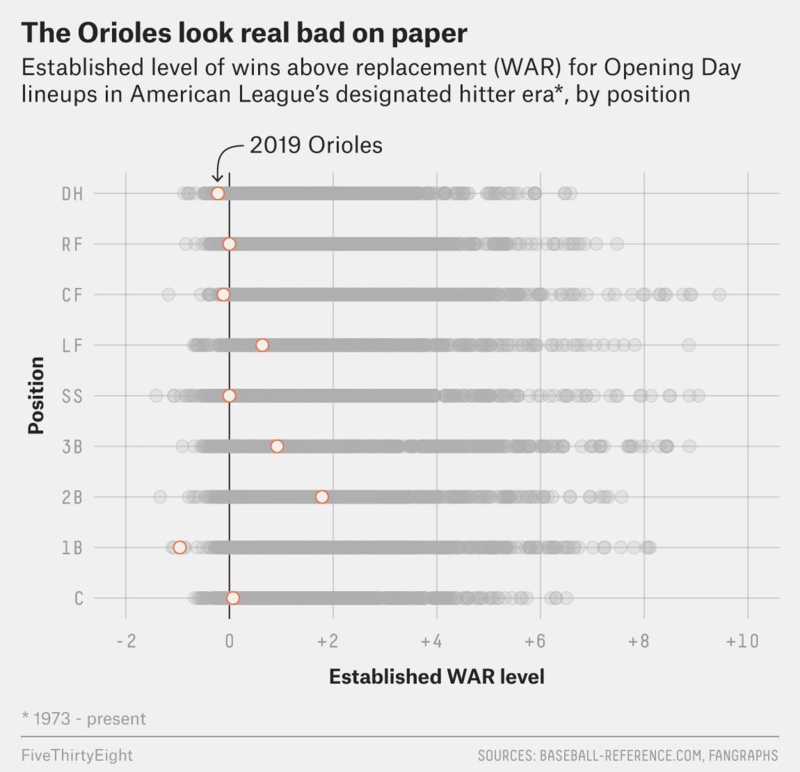 FiveThirtyEight explained some of the causes in an article that features a number of charts and graphics. The screenshot below features a scatter plot looking at the temperature and precipitation recorded from winter through autumn every year since 1895. I may have included some annotation in the four quadrants to indicate things like “hotter and drier” or “cooler and wetter”, but I am not convinced they are necessary here. With more esoteric variables on the x- and y-axis they would more likely be helpful than not. The rest of the piece makes use of a standard fare line chart and then a few maps. Overall, a solid piece to start the week. Credit for the piece goes to Christie Aschwanden, Anna Maria Barry-Jester, Maggie Koerth-Baker and Ella Koeze. Your author is back after a few days out sick and then the Armistice Day holiday. But guess what? The elections are not yet all over. Instead, there are a handful of races to call. Below is a screenshot from a FiveThirtyEight article tracking those races still too close to call. Why are there races? Because often time mail-in ballots need only be postmarked by Election Day. Therefore they can still be arriving in the days after the election and their total must be added to the race. (Plus uncounted/missed ballots et cetera.) For example, the late count and mail-in ballots are what tipped the Arizona senate seat. When we went to bed on Tuesday night—for me Wednesday morning—Arizona was a Republican hold, albeit narrowly. Now that the late count ballots have been counted, it’s a Democratic pickup. The graphic above does a nice job showing how these races and their late calls are impacting seat changes. Their version for the House is not as interesting because the y-axis scale is so much greater, but here, the user can see a significant shift. The odds were always good that the Republicans would pick up seats—the question was how many. And with Arizona flipping, that leaves two seats on the table. Mississippi’s special election will almost certainly be a Republican hold. The question is what about Florida? The last I saw the race is separated by 0.15% of the vote. That’s pretty tiny. The 2018 midterm elections are finally here. 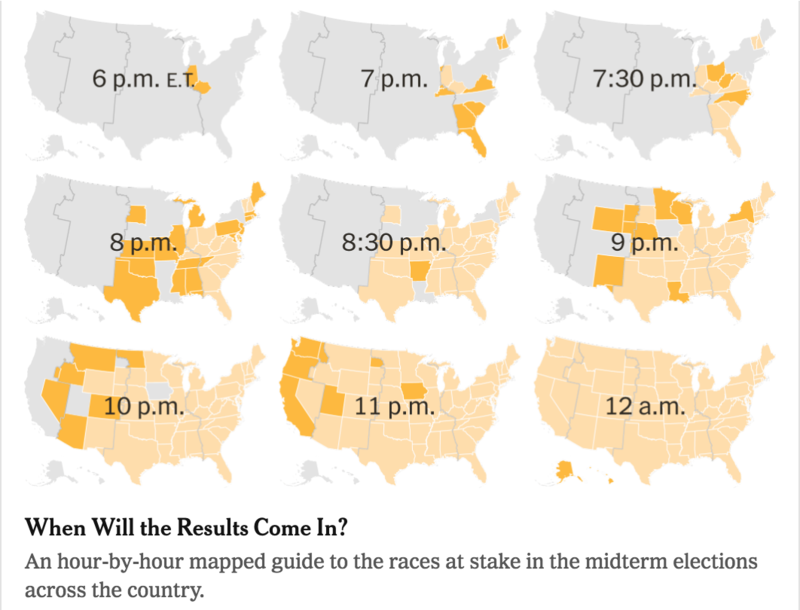 Thankfully for political nerds like myself, the New York Times homepage had a link to a guide of when what polls close (as early as 18.00 Eastern). I’m not saying you can’t keep voting. You just can’t keep voting here. It makes use of small multiples to show when states close and then afterwards which states have closed and which remain open. It also features a really nice bar chart that looks at when we can expect results. Spoiler: it could very well be a late night. The above looks at the House race. The first thing I want to point out is the control on the left, outside the main content column. Here is where you can control which model you want to view. For the whimsical, it uses different burger illustrations. As a design decision, it’s an appropriate iconographic choice given the overall tone of the site. It is not something I would have been able to get away with in either place I have worked. But the good stuff is to the right. The chart at the top shows the percentage of likelihood of a particular outcome. Because there are so many seats—435 are up for vote—every additional seat is between almost 0 and 3%. But taken in total, the 80% confidence band puts the likely Democratic vote tally at what those arrows at the bottom show. In this model that means picking up between 20 and 54 seats with a model median of 36. You will note that this 80% says 20 seats. The Democrats will need 23 to regain the majority. A working majority, however, will require quite a few more. This all goes to show just how hard it will be for the Democrats to gain a workable majority. (And I will spare you a review of the inherent difficulties faced by Democrats because of Republican gerrymandering after the 2010 election and census.) Keep in mind with FiveThirtyEight’s model that they had Trump with a 29% chance of victory on Election Day 2016. Probability and statistics say that just because something is unlikely, e.g. the Democrats gaining less than 20 seats (10% chance in this model), it does not mean it is impossible. The cartogram below, however, is an interesting choice. Fundamentally I like it. As we established yesterday, geographically large rural districts dominate the traditional map. So here is a cartogram to make every district equal in size. This really lets us see all the urban and suburban districts. And, again, as we talked about yesterday, those suburban districts will be key to any hope of Democratic success. 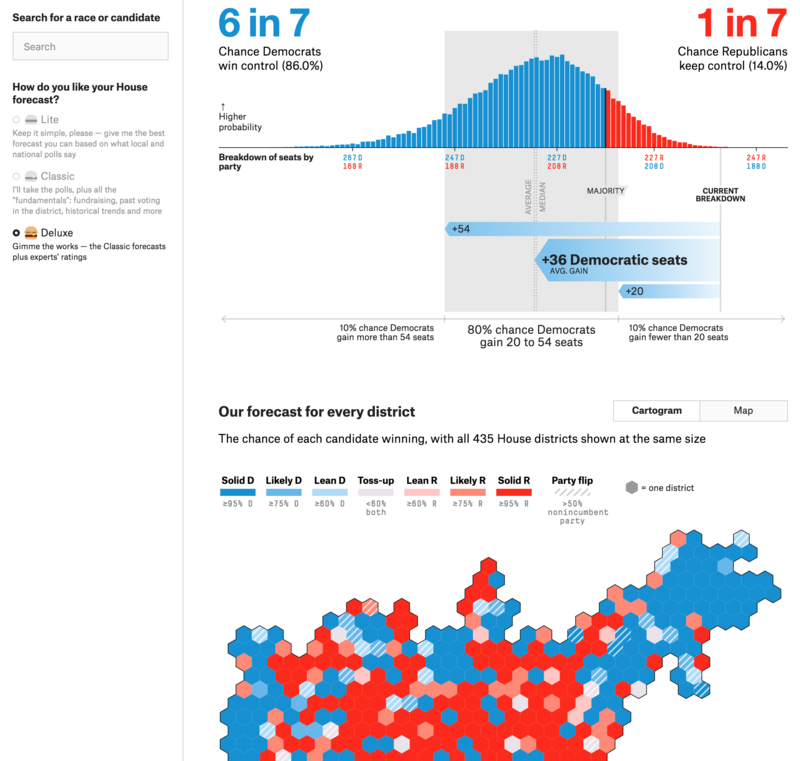 But with FiveThirtyEight’s design, compared to City Lab’s, I have one large quibble. Where are the states? As a guy who loves geography, I can roughly place, for example, Kentucky. So once I do that I can find the Kentucky 6th, which will have a fascinating early closing race that could be a predictor of blue waviness. But where is Kentucky on the map? If you are not me, it might be difficult to tell. So compared to yesterday’s cartogram, the trade-off is that I can more easily see the data here, but in yesterday’s piece I could more readily find the district for which I wanted the data. Over on the Senate side, where the Democrats face an even more uphill battle than in the House, the bar chart at the top is much clearer. You can see how each seat breakdown, because there are so fewer seats, has a higher percentage likelihood of success. The take away? Yeah, it looks like a bad night for the Democrats. The only question will be how bad does it go? A good night will basically be the vote split staying as it is today. A great night is that small chance—20%, again compared to Trump’s 29% in 2016—the Democrats narrowly flip the Senate. Below the bar chart is a second graphic, a faux-cartogram with a hexagonal bar chart of sorts sitting above it. This shows the geographic distribution of the seats. And you can quickly understand why the Democrats will not do well. They are defending a lot more seats in competitive states than Republicans. And a lot of those seats are in states that Trump won decisively in 2016. I have some ideas about how this type of data could be displayed differently. But that will probably be a topic for another day. I do like, however, how those seats up for election are divided into their different categories. Unfortunately my internet was down this morning and so I don’t have time to compare FiveThirtyEight to other sites. So let’s just wrap this up. Overall, what this all means is that you need to go vote. Polls and modelling and guesswork is all for nought if nobody actually, you know, votes. Credit for the poll closing time map goes to Astead W. Herndon and Jugal K. Patel. 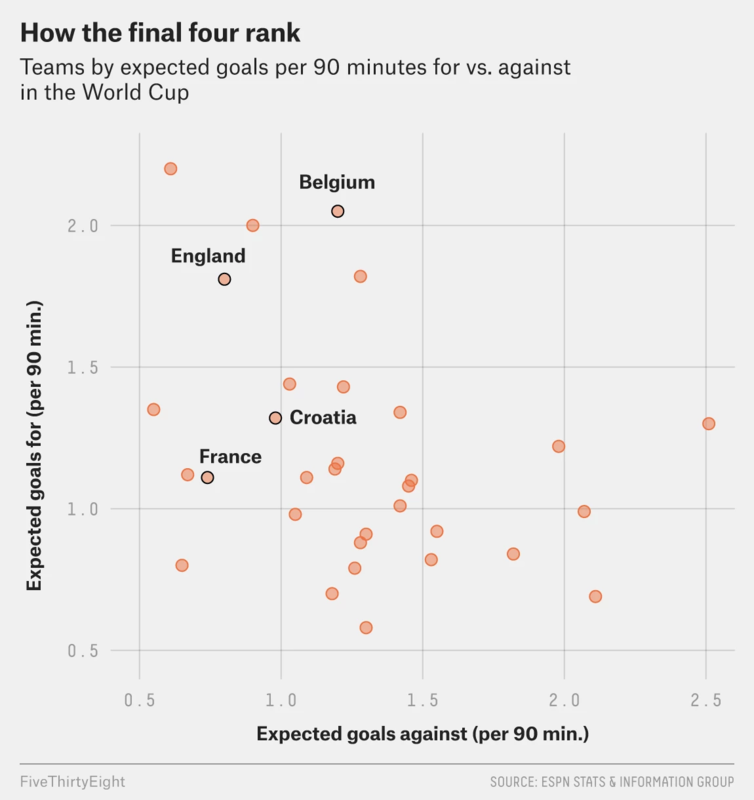 Credit for the FiveThirtyEight goes to the FiveThirtyEight graphics department. We are now one week away from the midterm elections here in the United States. Surprisingly, we are going to be looking at election-y things over the course of the next week or so. But before we delve into that, I wanted to focus on the homepage for FiveThirtyEight, the below screenshot is from my laptop. The reason I wanted to call attention to it is that right-most column of content. 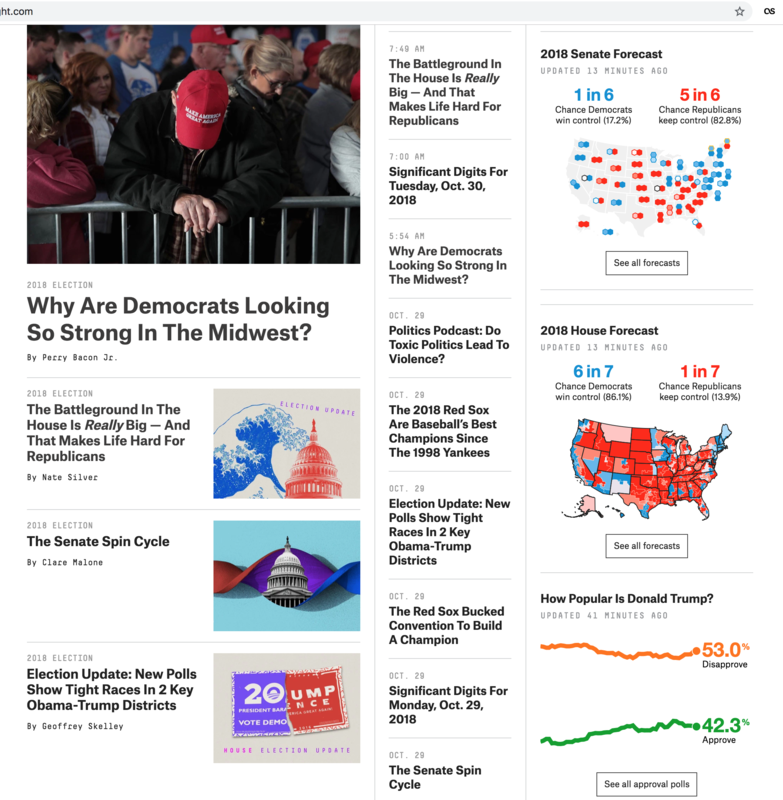 The site does a great job of succinctly providing the latest forecasts and polling number on the two main midterm results, federal representation in the House and Senate, along with polling numbers for President Trump. Starting from the bottom, the polling numbers chart works really well. It clearly and effectively shows the latest approval/disapproval numbers and their longer term trend whilst providing a link to a page of deeper data. It’s very effective. Moving up we have the House forecasts. These are tricker to see because so many of the more urban and suburban districts are inherently small geographically ergo very difficult to see in a small map. But the map does the job of at least providing some data along with the key takeaway of the odds of the Democrats flipping or Republicans retaining the House. Again, not surprisingly, it offers a link into the data. The Senate map is the one where I have the most difficulty. Now when we get to the actual page—hopefully later this week—the map shown makes perfect sense because it exists in a large space. 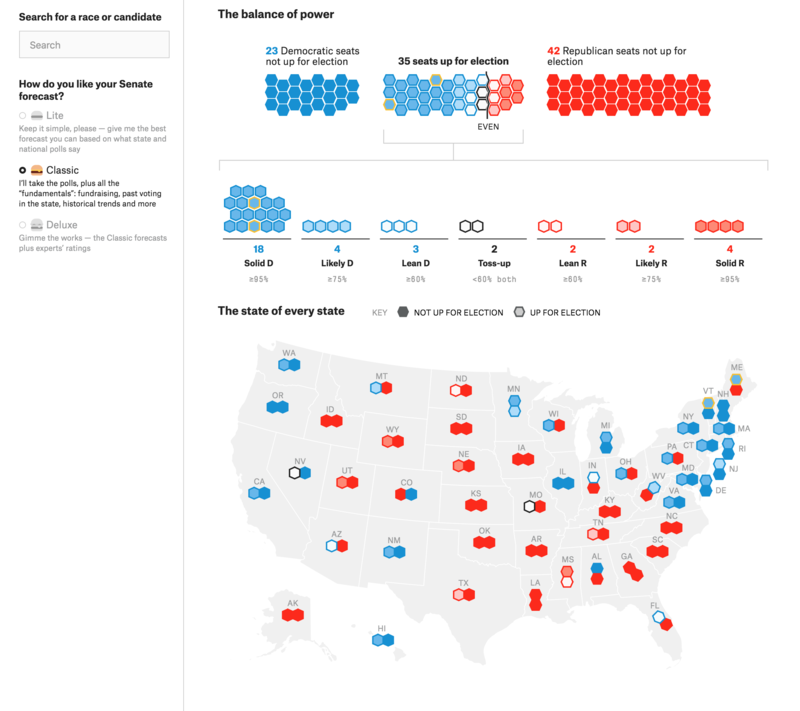 That space is needed to show two hexagons that represent each state’s two senators. But, similar to the problem with the House districts, the Northeast is so geographically cramped that it is difficult to show the senators from Maine through Maryland clearly. 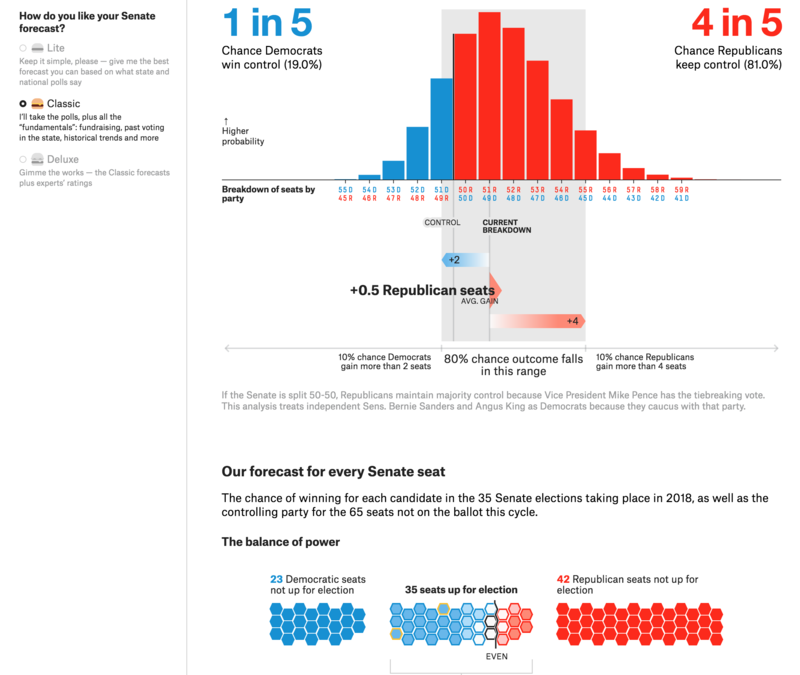 I wonder if some of the other visualisations on their Senate forecast page would have been a better choice. However, they do at least provide those odds at the top of the graphic. Credit for the piece goes to the FiveThirtyEight design department. This is an older piece that I’ve been thinking of posting. 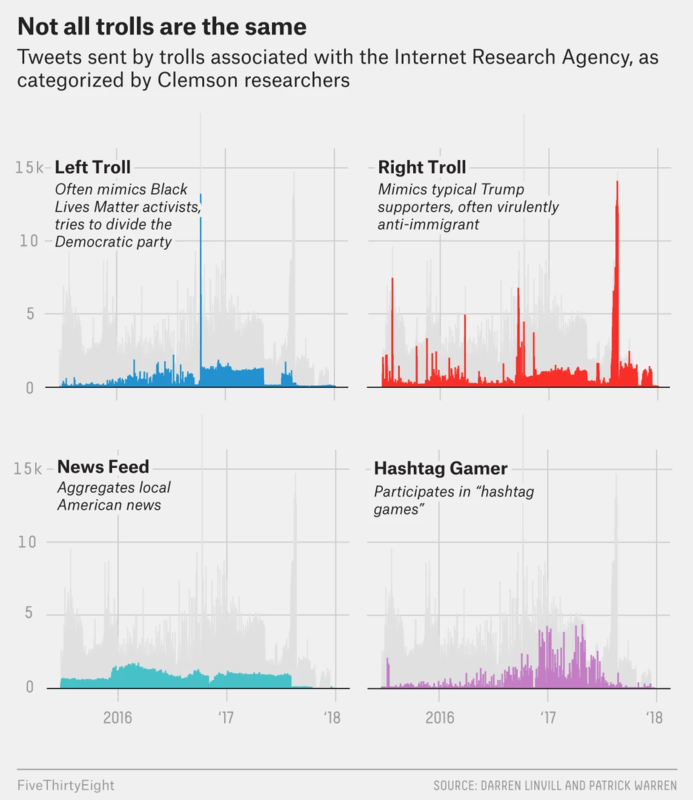 It comes from FiveThirtyEight and explores some of the data about Russian trolling in the lead up to, and shortly after, the US presidential election in 2016. They’re all just ugly trolls. Nobody loves them. 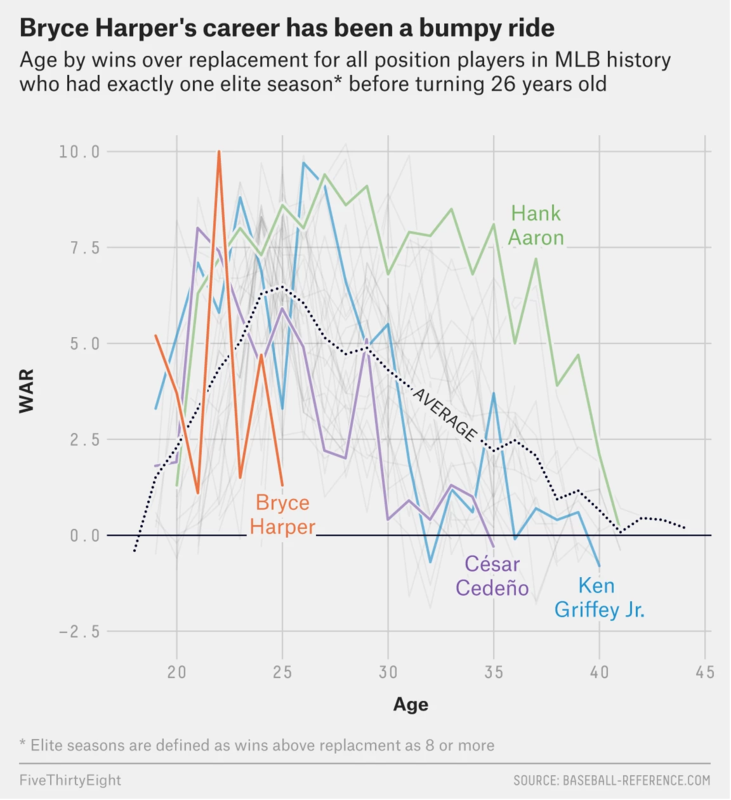 The graphic makes a really nice use of small multiples. The screenshot above focuses on four types of trolling and fits that into the greyed out larger narrative of the overall timeline. You can see that graphic elsewhere in the article in its total glory. From a design standpoint this is just one of those solid pieces that does things really well. 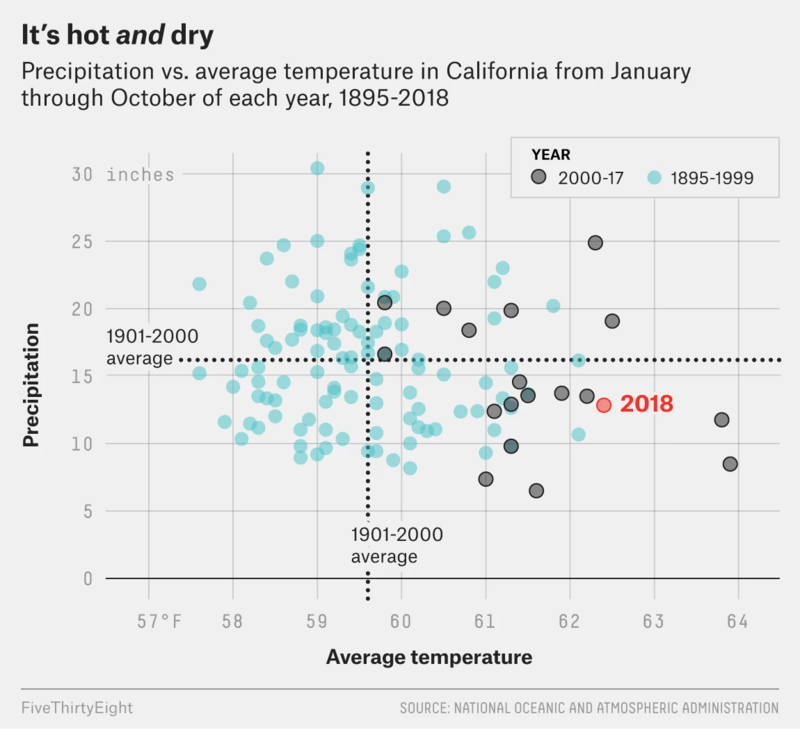 I might have swapped the axes lines for a dotted pattern instead of the solid grey, though I know that seems to be FiveThirtyEight’s house style. Here it conflicts with the grey timeline. But that is far from a dealbreaker here. Credit for the piece goes to Oliver Roeder. 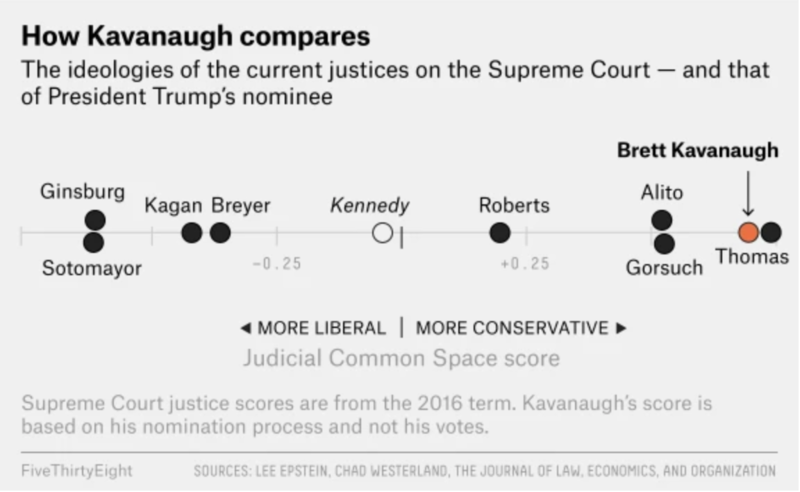 In terms of design, we can contrast this to yesterday’s dot plot about Kavanaugh. There the highlighted dot was orange with a black outline. Here, same deal. 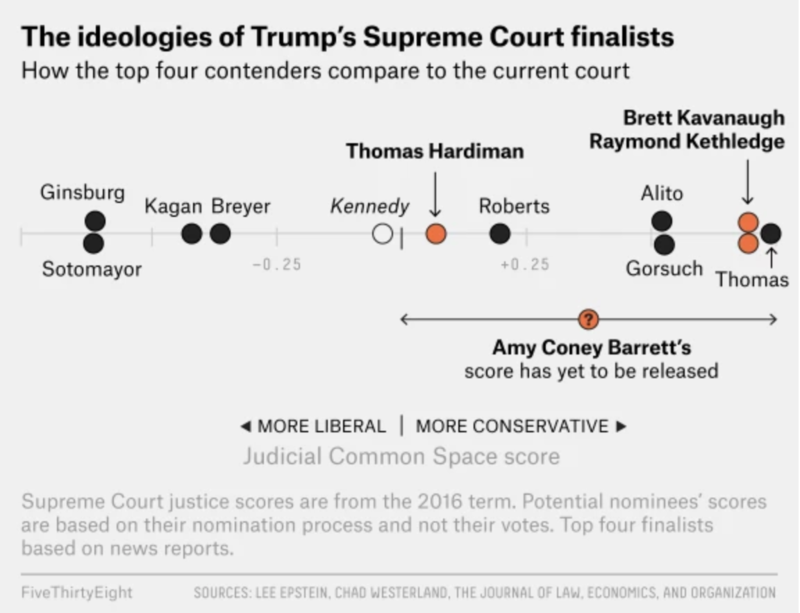 But yesterday, the other justices were shown with black dots and an empty dot for retiring Justice Kennedy. Here all the other countries in the World Cup are orange dots. Overall, it shows that today’s match between England and Croatia will be tough. And should England advance, a match against France will be even tougher. Credit for the piece goes to Bobby Gardiner.